Lisa Barcy is a Chicago-based animator who specializes in working with puppetry and stop-motion animation. She is also currently an animation instructor at DePaul University. Watch some of her work on Vimeo. Lisa Barcy is a brilliant animator based in Chicago who mixes different styles to create her ingenious short films. Here she is lying down with her adorable cat Nellie. 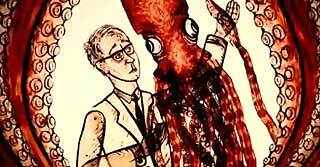 Douglas Sirk meets Jean Painlevé in Lisa Barcy’s melodramatic love story Mermaid, in which a married man falls in love with a giant squid. Watch an animated music video directed by Lisa Barcy for the song “Anonanimal” by musician Andrew Bird where undersea creatures do the happy dance. 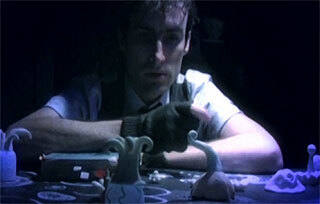 Lisa Barcy has re-edited her 16-minute animation called Mermaid into a music video for the song Lull by Andrew Bird.